Relaxing, calm and addictive as hell! 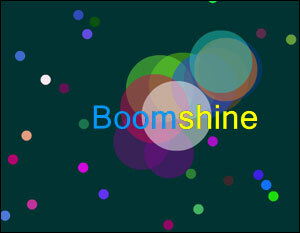 Boomshine takes the minimalist approach but succeeds on many levels. Much like Tetris, this game is perfectly suited for introducing your mom to video games due to its simple, non threatening gameplay. You can easily pop this on for minutes at a time and have a blast. Here's the concept in a nutshell: aim your mouse cursor, click to detonate as many of the floating balls as possible. Enjoy and be sure to share with your friends and family.